How well golfers respond to yet another instruction book depends in part on how many other such books they have read. For beginning golfers, this number usually can be counted on a finger or two of one hand. This can make some of the material appear fresh and new—mainly because it’s fresh and new to that reader. On the other hand, many long-suffering golfers keep eight or more how-to-golf books in their library, They’re in a pile next to the saved issues of a few dozen magazines, featuring playing tips that once helped them during a patch or two of bad golf. Then there are the hapless golf book reviewers, such as yours truly. Of the nearly 200 golf books I’ve read and reviewed at Hole By Hole, about 40 to 50 of them are some kind of golf instruction manual. The sheer number of such books probably means that I have forgotten more than I now know about how to play golf. In any event, let’s also recall that sometimes there is a vast difference between knowing what to do and actually being able to do it. That’s among the reasons why I appreciate the brisk, clear writing found in Lou Hays’ new golf instruction book, Make Your Golf Dream A Reality ($13.95 SRP). Hays makes good use of several valuable golf books that are in my library, but which I’d been neglecting. 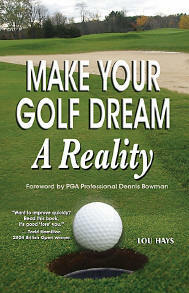 As he shows, the advice in these books is well worth reviewing, especially while preparing for a new golf season. The reason it resonates so well is that Hays has completely personalized his own remarkable experience with these instructors and their lessons. The way he integrates their advice in one slim volume should make many golfers think to themselves that they can also benefit from the same lessons. Hays started out much like the rest of us, a very high handicapper, with scores often in the low 100s. His reaction to this sorry record of non-achievement was far more focused than many others, however. He began to take lessons from local golf pros that were targeted to a particular problem that he would work on until he was satisfied of its resolution. Then he would work on another issue, and so on in succession. As he played, Hays also read. Books such as the now-famous Bob Rotella/Bob Cullen series that began with Golf Is Not A Game Of Perfect helped him understand how golfers can improve by focusing on the process more than the results. Even more important, Hays learned from the teaching pros and from writers such as Dave Pelz that the best chances for significant improvement for most golfers are found within 100 yards of the green, not at the tee box. In a stunningly short amount of time, Hays dropped his handicap from over 30 to just over 3. If that’s not an endorsement for focusing on the short game, I don’t what it is. For example, Hays stresses an approach to wedge play first popularized by Pelz in his Short Game Bible. Pelz and Hays swear to the advantages of training for defined backswing positions oriented toward the clock (7:30, 9:00, 10:30, and full). Golfers eventually know exactly what to expect for yardage from each shot with each wedge. This suggestion is dealt with at some length (naturally) in Pelz’s book. The summary Hays provides is either a great reminder or a new idea—depending again on the reader’s own prior search for written golf knowledge. It also helps that Hays writes with such a sprightly, positive tone. I have rarely been so inspired to begin the golf season with a renewed emphasis on practice, especially on the short game. The Rookery’s Director of Golf continues to struggle a bit during the Monday qualifying tournaments on the PGA Champions Tour. Oakley shot a 76 on February 19 while trying to earn one of nine spots for this weekend’s Ace Group Classic in Naples, Florida. That was four strokes too much, and put him in a large tie for 35th place. These qualifiers are growing in size. This week, for example, 66 players attempted to win a spot with a good finish in the 18-hole event.